A Florence bus is a perfect solution for tired feet. Although walking is the best way to explore the heart of town, after a while it can get fatiguing. Hopping on a bus will let you save precious energy that you’ll need for enjoying your visits to the city’s museums and sights. You don't want to be exhausted even before you climb up into the Cathedral Dome or Giotto's Bell Tower, right? 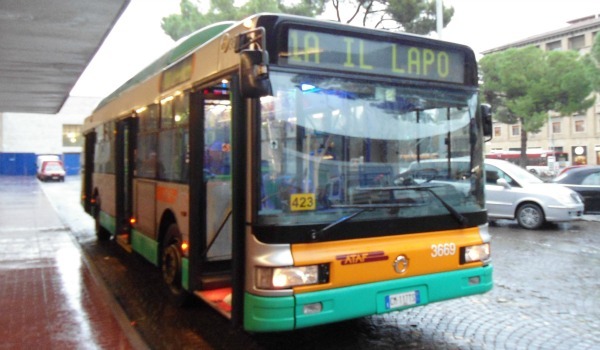 Moving around Florence by bus is easy enough if you know the basics...…so just read this page! The Florence bus that you are most likely to use is a mini-bus. These are small electrical buses that putter through the narrow downtown – mostly pedestrian – streets. The most useful route to know is the D line which starts off at the SMN train station in Piazza Stazione at the ‘Galleria’ stop (near big area for taxis). This is handy if you want to go over to the other side of the river, which from the station would probably take you about half hour walking. The D bus stops in the characteristic Santo Spirito area, then heads on to Pitti Palace and Boboli Gardens and then to the Ponte Vecchio from which you can easily reach Piazza Signoria and the Uffizi Gallery. Piazzale Michelangelo – on a hill over the city, an absolute must for spectacular views of the city! 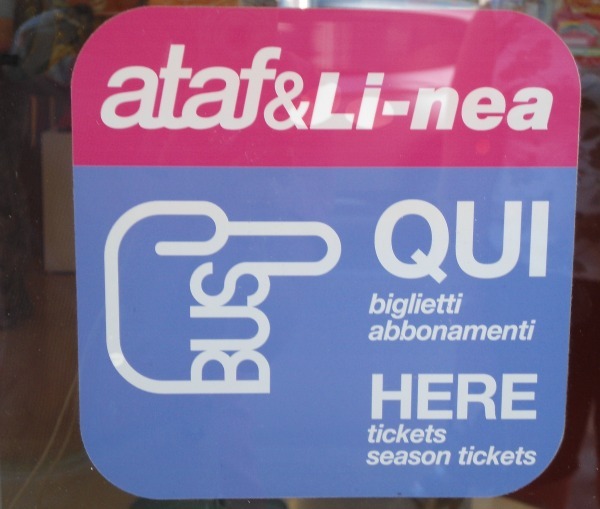 Ataf, the city bus comany has an excellent website with detailed information about all bus lines, routes and timetables. For city buses, you don’t pay when you get on board but you have to buy a bus ticket ahead of time. The easiest, fastest and most common place to buy tickets is at newsstands, tabacco shops and cafés (‘bar’). 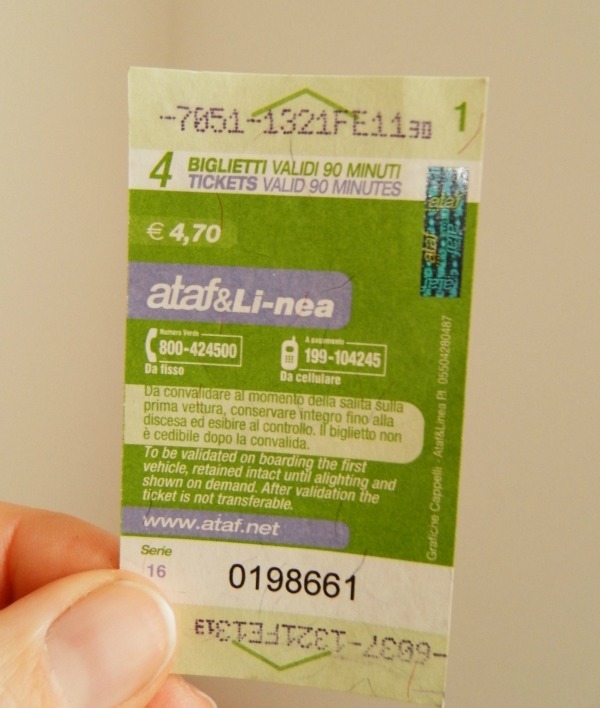 Most all news agents and coffee shops sell tickets, but look for a sign that says ‘ATAF-Linea’ (the local transport companies) that lets you know that they sell bus tickets. Another alternative is to go to one of the ATAF-Linea offices at the SMN train station. Tip! ATAF offices are also where you can pick up a free Florence bus map. 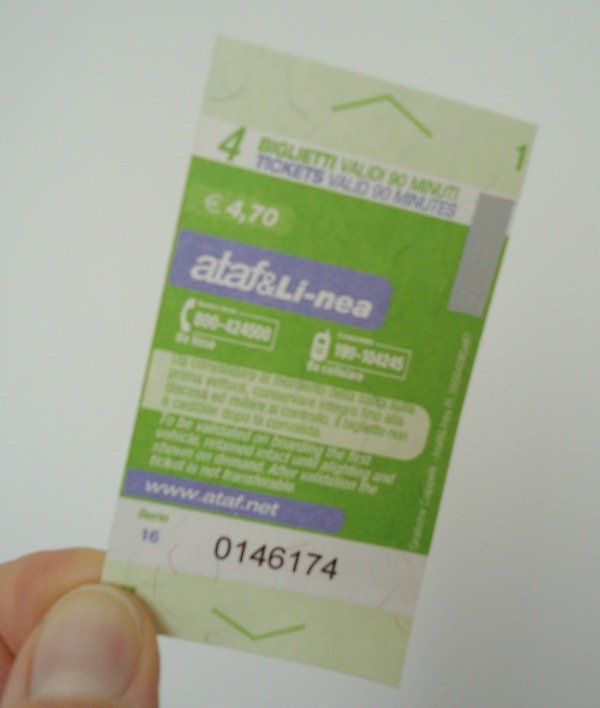 You can buy a simple ticket to be used once, or a multiple ticket to be used twice or four times. 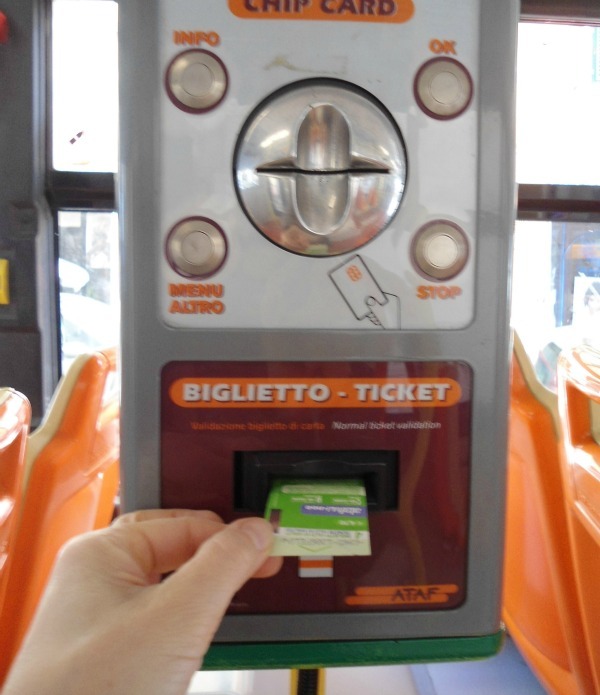 Then, when you get on the bus, you have to stamp your ticket in the machine. Tickets are valid for 90 minutes from the time stamped. During these 90 minutes you can get on and off as many buses and routes as you need to. If you buy just a simple ticket, at the end of the 90 minutes you just throw it away. If you buy a multiple ticket, keep it until you have stamped all the sides and used it up. BTW, more than one person can use a multiple ticket. 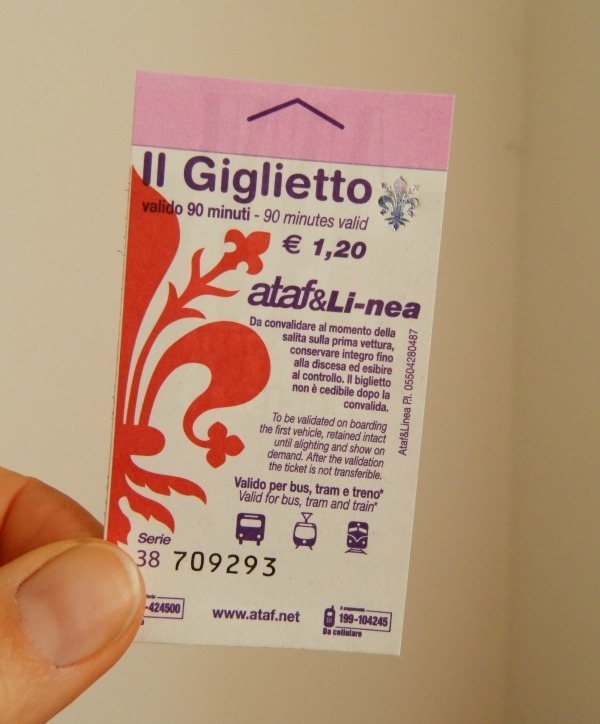 If it's you and a friend, and you want to make a round trip to Fiesole, you can buy just one 4 journey ticket. Going there you stamp two sides, and coming back you stamp the other two sides. If an inspector asks you for your tickets, just show them the one ticket double-stamped! The pic below shows where you can see the time stamped on your ticket. You have 90 minutes to re-use it after the time shown, so this ticket stamped at 11:30 is valid until 1 pm. There are also day tickets if you think you’ll be using buses a lot. 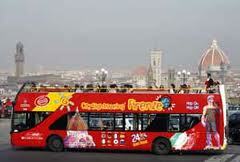 Then there are the double-decker open-top sightseeing buses. What's better than a Florence bus tour for getting a good overview of the city while you are comfortably and quickly accompanied from one highlight to the next? The sightseeing bus also goes to Fiesole (included in the price of the ticket) so you don't miss out on this popular hilltop village and its marvelous views of Florence! If you're in town for a short stay, I really recommend this time saving and very relaxing way to get to know Florence. Large coaches are run by the Sita company which are very convenient for trips to nearby towns. If, for example, you want to take a bus from Florence to Siena or San Gimignano - two very beautiful and popular Tuscan cities - the Sita routes are a good option. Buses go several times a day and you can get tickets and scheduling info at the terminal in via S. Caterina da Siena, right near SMN station on the side where the tram tracks are. Here's a map to see the location of Sita. 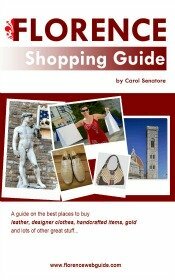 Everyday vacationers to Florence flock to the outlet malls outside of town in search of great bargains on top labels. Gucci, Prada, Ferragamo, Armani, just to name a few, have outlet centers that are easily reachable by shuttle buses leaving from near the train station. You can save up to 50% off the market price on designer bags, shoes, and clothes - no wonder the lines are so long to get in the door!